Every 20 to 30 years, Saturn's atmosphere roils with giant, planet-encircling thunderstorms that produce intense lightning and enormous cloud disturbances. The head of one of these storms—popularly called "great white spots," in analogy to the Great Red Spot of Jupiter—can be as large as Earth. Unlike Jupiter's spot, which is calm at the center and has no lightning, the Saturn spots are active in the center and have long tails that eventually wrap around the planet. Six such storms have been observed on Saturn over the past 140 years, alternating between the equator and midlatitudes, with the most recent emerging in December 2010 and encircling the planet within six months. 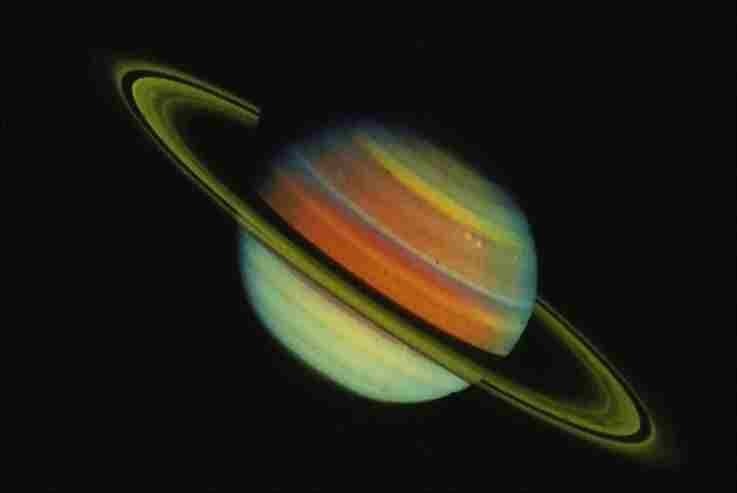 The storms usually occur when Saturn's northern hemisphere is most tilted toward the sun. Just what triggers them and why they occur so infrequently, however, has been unclear. Now, a new study by two Caltech planetary scientists suggests a possible cause for these storms. The study was published April 13 in the advance online issue of the journal Nature Geoscience. Using numerical modeling, Professor of Planetary Science Andrew Ingersoll and his graduate student Cheng Li simulated the formation of the storms and found that they may be caused by the weight of the water molecules in the planet's atmosphere. Because these water molecules are heavy compared to the hydrogen and helium that comprise most of the gas-giant planet's atmosphere, they make the upper atmosphere lighter when they rain out, and that suppresses convection. Over time, this leads to a cooling of the upper atmosphere. But that cooling eventually overrides the suppressed convection, and warm moist air rapidly rises and triggers a thunderstorm. "The upper atmosphere is so cold and so massive that it takes 20 to 30 years for this cooling to trigger another storm," says Ingersoll. Ingersoll and Li found that this mechanism matches observations of the great white spot of 2010 taken by NASA's Cassini spacecraft, which has been observing Saturn and its moons since 2004. The researchers also propose that the absence of planet-encircling storms on Jupiter could be explained if Jupiter's atmosphere contains less water vapor than Saturn's atmosphere. That is because saturated gas (gas that contains the maximum amount of moisture that it can hold at a particular temperature) in a hydrogen-helium atmosphere goes through a density minimum as it cools. That is, it first becomes less dense as the water precipitates out, and then it becomes more dense as cooling proceeds further. "Going through that minimum is key to suppressing the convection, but there has to be enough water vapor to start with," says Li. Ingersoll and Li note that observations by the Galileo spacecraft and the Hubble Space Telescope indicate that Saturn does indeed have enough water to go through this density minimum, whereas Jupiter does not. In November 2016, NASA's Juno spacecraft, now en route to Jupiter, will start measuring the water abundance on that planet. "That should help us understand not only the meteorology but also the planet's formation, since water is expected to be the third most abundant molecule after hydrogen and helium in a giant planet atmosphere," Ingersoll says. 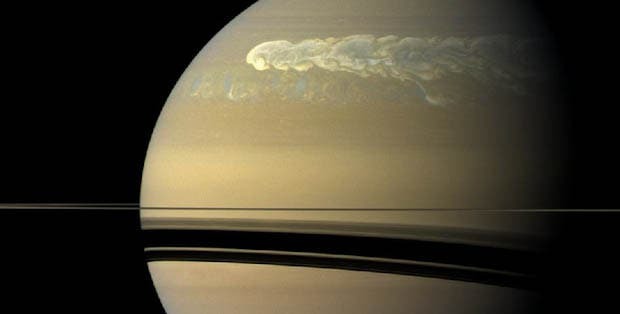 The work in the paper, "Moist convection in hydrogen atmospheres and the frequency of Saturn's giant storms," was supported by the National Science Foundation and the Cassini Project of NASA.